The University of Minnesota Rosemount Research and Outreach Center (RROC) is embarking on the design and development of a new teaching, research and outreach garden to be known as the CFANS Discovery Gardens. The Discovery Gardens will be a destination where visitors are engaged in horticulture education that fosters a “Come-Discover-Adopt” philosophy about horticulture in Minnesota: historical aspects of the land, healthy food, and sustainable and environmentally responsible horticultural practices for Minnesota landscapes and gardens. It will also serve as a setting for volunteer Master Gardeners to hold educational tours, workshops, and other gardening/landscape programs. these will help to foster an increase in public knowledge of horticultural plants and practices applicable to their own properties. 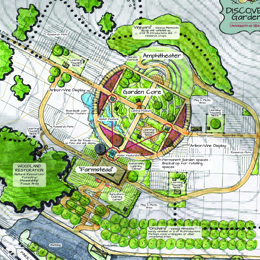 After a public RFP process in 2013, the Kestrel Design Group (Kestrel) was retained to help develop an overall concept design for the Discovery Gardens. Kestrel proceeded to work with the RROC Garden Program Director and the Design Selection Committee (DSC) to ensure the concept would exemplify the vision and goals of the RROC and other stakeholders. 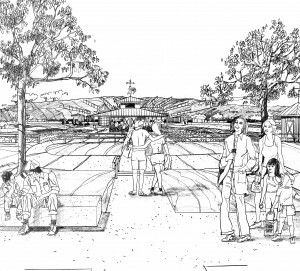 Kestrel developed one detailed concept plan for the Discovery Gardens – combining landscape architectural principles, detailed site analysis, precedent studies, and overall project goals. This design for the Discovery Gardens provides the framework for CFANS and RROC to develop specific learning experiences for individual garden spaces. The garden landscape and natural areas of the Discovery Gardens will focus on three key themes that will recur throughout the site: LEARNING & TEACHING, SUSTAINABILITY, and FOOD & HEALTH. Significant connections and collaboration at the gardens will be encouraged with CFANS programs, staff and faculty, U of MN Extension programs, staff, faculty and volunteers, Minnesota Department of Natural Resources and Dakota County. CFANS has since retained Kestrel to continue with the project design and detailing through costing and continuation into Design Development.